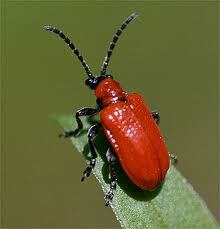 Beware the dreaded lily beetle is already on the prowl in South West England. These pesky things are an absolute menance and ruin not just lilies, they like any of the lilium family and frequently attack crocosmia, day lilies and hyacinths. The little blighters contrary to belief can fly. Their young look like black blobs of sticky excrement, which is exactly what it is. They cover themselves in their own poo to hide from predators. I don’t like using any chemicals or sprays in the garden, particularly as we have a large koi pond but I’m afraid I rage war on these creatures. I use a systemic insectide, one especially made for lily beetles. Their method of escape is to drop to the ground and burrow into the soil if they see so much as a hand spray near them. I’m just not quick enough to catch them any other way. Never run out of fresh milk again. Milk freezes very well so always keep several pint bottles of fresh milk of the sort that comes in plastic bottles. Milk freezes well. It does look yucky when frozen but returns to normal and thaws swiftly. Other than that, you may have to buy a cow. Do you ever find the plastic caps on your tubes of paint break, becoming useless long before the paint’s run out. If by strange chance an empty tube still has it’s cap in tact, thoroughly clean, scraping out any conglomeration of paint on the insides, and keep as spares.